From the archives: We apparently had the coldest spring on record in this area. It's finally getting warm again, and today I started my first batch of mugicha this year. Here is a slightly updated article about mugicha, or toasted barley tea, my favorite non-alcoholic summer drink. This was originally published on May 10, 2007, and updated on June 10, 2008. I've added another update at the end. When we were growing up, my mother frowned upon most sugary drinks for us kids. So things like sodas were generally not stocked in the house - an ice-filled cup of Coke was a great treat whenever we went out to eat. Things like Calpis, or when we lived in the U.S. Kool-Aid, were strictly rationed. The cool drink we always had in the refrigerator was mugicha, or barley tea. Even when we lived in White Plains, New York, there were always a couple of jugs of mugicha in the large American refrigerator. Mugicha is traditionally made by briefly simmering roasted barley grains. It has a toasty taste, with slight bitter undertones, but much less so than tea made from tea leaves. To me, it's much more refreshing to drink than plain water. My anti-sugar mother always made sugarless mugicha, but my younger self craved the sweetened mugicha that most of my friends' mothers seemed to make. I always begged my mother to make sweet mugicha, but she always refused. Some day, when I am the one making mugicha, I'll put all the sugar I want in it, I used to think. So, when I reached my teen years, and my mother was back working full time, I used to pour rivers of sugar into the mugicha. My little sisters loved it. I'm not sure if it made them more hyper than usual, though I have vague memories of my younger sister sitting on my head when she got bored. Now that I am nominally an adult, I much prefer unsweetened mugicha. I'm growing more like my mother as I get older, a rather scary thought. You can buy mugicha in three formats. The most traditional kind is just loose barley grains that have been roasted to a deep, dark brown. 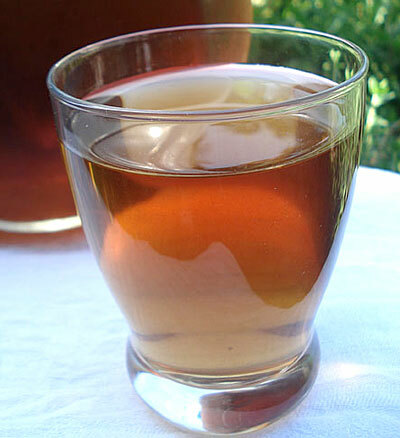 The second, and most popular are mugicha tea bags meant for cold brewing. Then there are 'hybrid' type tea bags, which can be simmered or cold brewed. Simmering makes the most robust tasting and dark mugicha. To make mugicha this way, bring water up to a boil, throw in the loose grains or a tea bag, lower the heat and let simmer for a couple of minutes. Turn the heat off and let cool in the pan to room temperature, then strain and chill in the fridge. Allow one tea bag or 2-3 tablespoons of loose grains per liter (about a quart) of water. Cold brewing is so convenient though that I tend to make mugicha this way most of the time. It's lighter in color and taste, but refreshing to drink nonetheless. 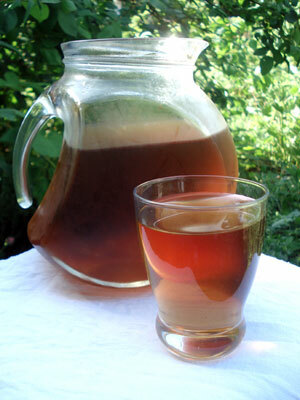 Just put a mugicha tea bag in a jug of cold water and put it in the fridge; when it's nicely chilled, the tea is ready. You can also brew it in the sun, like sun tea, if you prefer. As I've noted above, mugicha can be sweetened or unsweetened, to your taste. Many people in Japan believe that mugicha helps to cleanse the body. There have been studies done that may indicate that it helps to reduce stress and so on. I sort of tend to think that the rehydration factor plays a large part in this but it doesn't hurt anyway. Mugicha is naturally caffeine free. Mugicha (or boricha as it's called in Korean) can be purchased at any Japanese or Korean grocery store, though some may only stock it in the warm months. The one thing to watch for is freshness - since it uses whole barley grains, it can turn rancid. Once I open one of the foil packs, I put it in a plastic bag and use it up as soon as possible. Any left over is stored in the freezer. I try to use up any opened packs before the summer is over. For U.S. readers: The reliable Uwajimaya sells House (that's a manufacturer called House, not Uwajimaya's 'house brand') brand cold brew type mugicha and simmering type mugicha via Amazon. You can also get mugicha that's been blended with regular tea and/or other herbs with various health or weight loss claims on them. For UK/Europe: Japan Centre stocks the House cold brew type. And elsewhere, you can order cold brew type tea bags from J-List, who ships worldwide. You can buy bottled mugicha too, even a Hello Kitty one. You may want to try a bottle of mugicha first to see if you like the flavor, before going for the tea bags. A lot has happened since I first posted this back in 2007. We sold our house in Switzerland, spent more than a year as nomads before finally buying a run down house in Provence, France. And, after a couple of serious illnesses including cancer, I'm now a Type II diabetic. I don't know how to explain what it's like to be a diabetic to non-diabetics, but the short version is, it's a major bummer. Sugar and carbohydrates form such a major part of a typical diet - and when you have to watch your intake of both, it's just, well, annoying. It is not like having a sugary drink will kill me instantly, but it's certainly not good for me, and if I ignore my blood sugar and keep on drinking sugar-filled drinks the results will probably be dire. And while beverages with artificial sweeteners are available, I'm not really sure what the long-term effects of drinking tons of diet coke and the like are either. I don't know what I'd do really if it weren't for tea, including mugicha. I have been trying more and more teas lately, from herbal teas sold at our local markets to splurging once in a while on the beautiful and expensive teas sold by Mariage Frères. I've always loved tea, but I appreciate it even more now. As I wrote above, my mother never let us kids put sugar in our mugicha, so I grew up with unsweetened tea. When I take a good, long sip of mugicha, it brings me right back to my childhood. And unlike many other childhood food memories, this one is still good for my body. Submitted by maki on 2013-06-05 11:14. I'll have to try this soon. My dad loves the stuff, but I've never actually tried it. Spending childhood years in ol' Japan got me hooked on Yakult and Ramune and Melon Soda (recently). However, I can not get into Calpis. I cannot get into Calpis, either. However, I encountered the carbonated version, Calpis Soda, during a recent trip to Japan, and I can't get enough of it. It's amazing what a bit of carbonation does to the taste. You could give it a try, too. I've never had sweetened mugicha before! My mom always makes it unsweetened too, as did my Japanese friends. I can't imagine sweetening it-- I love the unadulterated roasted barley flavor. they sell packages of about 20 large tea bags for $2 at my local Daiso $2 dollar store (in vancouver, canada). i don't really know how it compares to the best of the best brands out there, but i think it's fairly close. really? sweetened mugicha? I have never tried that, but I like my mugicha (and sencha, genmaicha, houjicha, etc.) plain. Malting is the limited germination of the barley grain under very carefully controlled conditions. There are three phases: Steeping, germination and kilning. Steeping encourages germination to start, germination prepares the conversion of the starch to sugars, and kilning stops the germination to ensure that very little of the starch is hydrolysed. Conversion of starch to maltose occurs in the mashing process. Ha ha! Don't be scared....just embrace it because it's inevitable! What about roasting/toasting one's own barley, would that work? I was wondering the same thing. The local Korean mart only has powdered insta barley tea. I recently tried this Korean tea called 17 Tea that has 17 (hence the name) different herbs and etc, but I think the main delicious flavor is barley. Ha! I’m like your mother. Ha! I'm like your mother. No sugary drinks in the house. They called me the soda cop ^-^ . Calpis was the rare fun in summer. Now that almost all are adults, they don't drink soda very often. Ha! A couple of years ago, I drank a cup of hot mugicha (by pure chance). I was surprised how good it was (and didn't immediately realise what it was...). I'm also very glad that we can buy now the Green Tea for cold brewing very cheaply these days. PS: The sun tea was a first for me. I'll have to check that out. Thanks! So was my host mom the koolaid mom on the block? Her mugicha was always delightfully sweet. I like it both ways though, and am planning my trip to the local Japanese grocery so I can start the first batch of the summer. Thanks - my stomach is growling now! I had never had mugicha before, but whilst shopping for some delightful lychee candy that I adore, I also picked up a packet of these tea-bags to give it a go... I must admit, it is a winner for me! I do think I would like to try it with a squeeze of lemon, but I don't think I will be sweetening it any time soon. The fam and I visited Uwjimaya this weekend. They had a pot of cold mugicha...took me right back to my childhood so I couldn't pass up a 50 pot bag of teabags! What a great drink. My kids may go for the sweetened version. I'll have to try that! now that's a great way to advertise mugicha...put out a big cold pot of it! Thank you for the storage and brewing information. I just started a diet for a health condition that requires giving up most of the hot beverages I love. Mugicha was on the list of allowed drinks so I bought a big bag. It's delicious and helps me live in a world free of tea or coffee. This sounds like the basis for a non-alcoholic beer. I would imagine that it would taste like a porter with all of that lovely roasted malt. I love mugicha! hot or cold... but I've never had it sweetened and can't imagine sweetening it. First time I had mugicha was actually in a Korean restaurant in New Zealand and I thought it some odd tea/coffee concoction, due to the roasted flavour of the barley. But I love it now, hot in winter and cold in summer! Never tried brewing whole grains before, Always had mugicha teabags. Which is better, grains or bags? I buy the whole grain roasted barley from my local Korean market, and boil a big pot of tea. It's delicious, just as the Korean restaurants and Korean moms make it. I've never had the teabags, but would think they don't compare to whole roasted barely grains. If you like the cold version, I like to make a concentrated pot, refrigerate it, and then when my family wants cold "boricha" - the Korean name - we put ice in a glass, add some of the concentrated boricha, and add water... it's really refreshing and delicious. I remember living in a girl's dorm in Japan, and every morning there would be hot or cold mugicha served with breakfast - if you wanted coffee or another tea, you had to make it yourself, and even cold water was tap only. When I got back a few weeks ago, jetlagged and dying of thirst, the first thing I bought was a carton full of the stuff - and I've been having a hot cup every morning since. Green and black teas upset my stomach in the morning (it's the tannic acid, I think), but mugicha is always refreshing. And I'm sure the lack of caffeine isn't hurting me any! I picked up a love for mugicha in Japan, very refreshing in the summer, and yes it is an acquired taste, i really love the long tea bags made for plastic bottles, very handy. Have you ever had Goya Malta? I'm curious if it would taste similar - it's a very popular Mexican beverage that's made from sweetened carbonated dark barley. It would be interesting to find out that everyone just really likes to drink sweet barley. I've never had Goya Malta, but I'm curious to try it (will put it on my shopping list for my next trip to the US). Though mugicha itself is not malted so there might be a difference... (and the standard form is not sweet). I LOVE unsweetened barley tea. Every time I drink it, I close my eyes and think about the time when I was 6 years old and visited Japan for the first time. The smell is amazing as well. I love to drink it while eating cold buckwheat noodles with shredded cucumber on top. I never bothered trying it sweet (not even as a kid); lately I've found myself too overwhelmed with the amount of sugar in lemonade and sodas. I have a rule of no soda/juice at home, so boricha is great. Another option I'm going for lately is azuki bean tea. Just put some azuki beans in a pot of water and let boil as much as you want (mine's a very deep red, I re-boil, don't know if that's good). It's said to be good for dieting and cleansing the body. Unlike mugicha it's not bitter. It has an almost tasteless smooth feeling while drinking. Can't really explain it but it's very good, especially in hot days. I expect that a very light Brewers Crystal Malted Barley may work here. Most Crystal Malt found in my local Brewstore is around (the very lightest) is around 20 Lovibond. Look for the lightest grain, Cara Pils is the lightest. To give you an idea what you get, most malt is 1-3 Lovibond, by roasting the malted grains you get a darker more molasses like color. I bet you could make it with unhopped powdered malt extract. Malted extract comes in various color levels with the strongest being very dark (dark brown) all the way to a pale extra light (think light ale color), both are measured in Lovibond. It won't taste like beer at all. Malted Barley Extract isn't very expensive and can be found at your local brewers shop and can be purchased online. You can buy it in cans but 3 lbs is a lot to use at once. Bakeries use it too but it tends to be sulphered to extend shelf life. Ick. If Interested, I will help you find some in your area. Hope this helps. Dedicated to all things yummy. it looks like you want to steep it for up to an hour at 153-155F - always being sure to keep below 180F (water boils at 212). Your description of starchy and grainy seems to indicate unconverted starch and extracted tannins. A friend introduced me to a tea she called "bread tea" because it tasted like liquid bread. Turns out it was mugicha, which I love. I used to drink it all summer when I lived in Tokyo but never thought I could find it in the U.S. I'll have to look for it at the tiny local Japanese market here in Las Vegas. Now, if only I could find Chu-Hai!!! Barley tea is so wonderful and unsweetened is so healthful. I have been looking for the roasted barley for quite some time - I used to find it easily years ago and cannot now. It's possible I was looking off-season for the tea and that's why I wasn't finding it. Thank you so much for posting a source for it. Also for the instructions on how to use and keep it. Hah, didn't even see the comment from mysofa, but I happened to have half a pound of 60 Lovibond (medium darkness) crystal malt left over (I bought too much for the SDPA I brewed a couple weekends ago and it's been sitting in my cupboard since). I'd noticed this post when it went up the other day, and remembered a Korean coworker back in college who had me drinking barley tea for a while. Tonight I was cleaning the cupboard, and noticed the bag of barley. Now, from my memory of what I had before, I think the closest thing would be unmalted roasted barley (if you drink the stuff in quantity, you might definitely consider checking your local homebrew supply). As I sip the stuff, I'd say the crystal gives a very interesting, if quite different, effect. For those of you who don't have your head in a brewkettle, I'll go over the difference. Malting is the process of partly germinating a grain, then stopping the process by kilning it. This allows enzymes in the grains to convert some of the starches to sugar. Crystal malt, in particular, is prepared by a special process which causes the sugars to crystalize and, to some extent, carmelize. It's used to add body to beer, since some of the complex and carmelized sugars it contains do not ferment (it also aids in head retention). So what kind of tea does it make? As you'd expect, it is sweet, though not overpoweringly so, with a more complex sweetness than you'd get just adding sugar. I haven't tried it cold yet, but I think it'll work well there. I was just thinking about it, and remembered that what's sold as "roasted barley" at brewshops is really black stuff used in stouts and porters; you might actually try just plain unmalted barley, though, and give it a quick toast in the oven? Bags of House mugicha have become a staple and we always have some brewed in the fridge, summer and winter. The main inconvenience was fishing out the bag from a jug after a couple of hours as it gave off an unpleasant ashtray smell/taste if I left it in there too long. The basket stops the mugicha from 'overbrewing' (and works nicely with green tea bags too). I highly recommend this jug for anyone who makes mugicha regularly. Incidentally, barley tea is also a traditional drink in Spain. There it is always sweetened, often iced, and called Agua de Cebada. As a child, despite my sweet tooth, I didn't like it much, I thought it was diluted coffee. Strange how I've taken to unsweetened mugicha as an adult, and unlike tea (caffeine will quickly make me tense and anxious) I can drink unlimited quantities of the stuff. its the only way i know! That looks delicious. I love tea and barley but never tried before. Yummy! Something similar, but perhaps sweeter, is tea made from malted grains (germinated before roasting). I got around making some rye tea after I read about "mock coffee" of the 40s and have loved it since. They used simple roasted grains and peas, but I'm quite attached to widely available brewing grain. Thanks for pointing out this and sun brewing too, it might be an interesting experiment! I love grain flavors with a passion. I'll definitely see how barley mugicha tastes when I have to roast plain barley. What about using spent grains? My own Guy brews, but I know very little about that process. I'm just always looking to put the leftovers to good use. Thanks! I enjoyed your article on barley tea. I also tried to raise my children without the sugary beverages and wish I had known about mugischa. Recently I found a recipe for Banana Barley Bread, so I'm passing on to you and your readers to try. I haven't made it yet because I can't find barley flour but I'm sure it's out there! a little olive oil; pour in the batter, dividing equally. Rancid? Oh, dear. I just ran up the stairs to put my vaccuum jar of the stuff into the freezer, though it may be too late. (I can't tell what the smell of rancid barley would be -- it didn't smell very good right out of the package to begin with.) However, the taste is lovely - very nutty and toasty, I'd go through pots of it before I got too lazy to put the kettle on. I should get back into the habit. So happy to have stumbled upon your site while looking for instructions on how to brew mugicha. I miss so many foods and flavors from Japan, only some of which I can find at the Japanese grocery store (which is 2 hours away). While there, I found a bag of the simmer type mugicha bags. Since my kanji comprehension is limited, I wasn't sure I was reading the directions correctly. I didn't end up making the tea right away, and the bag got shuffled to the back of my pantry. Two years later I am clearing out the pantry and OH! Has it definitely gone bad at this point? How can I tell? It doesn't smell bad...perhaps I will have to make a batch and see how it turns out. I like the idea of hitting up brew shops for freshly roasted barley. Thanks for the good suggestions! 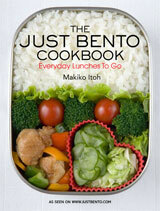 Makiko Itoh, how much I enjoy JUST HUNGRY! I live near Boston, what is the price range I should expect to pay? always enjoy reading your site! Natsukashii~! Barley tea was the first thing I was offered to drink when I arrived in Japan the summer I was 16, and I've adored it ever since. I'm actually drinking a glass of it right now, and I always keep a pitcher full of it in warm weather. I'd never heard of sweetening it though. I put a bit of sugar in mine just now and had to dump it down the sink and pour a fresh glass! Bleh! To each their own, I suppose. I agree that it does taste a bit like hay, but that's what I like about it! They have mugicha in China, too - there it's called maicha (in Mandarin). When I studied there one summer, they sold it in bottles and it was always sweetened. Here in the US I've managed to track the tea bags down at a local Asian market, so I get to have all the cold mugicha I want~. I've found that I like it just fine without the sugar. I love barley tea. The first time I visited the Japanese Market in Pittsburgh, my dad bought some looking for a big bag of any kind of tea, and he didn't like it too much, but I love it! Unsweetened barley tea has also helped me remove sweet drinks from my diet, because I'm perfectly happy having barley tea instead of a sweet drink. Currently learning Japanese for my own personal interest, and i decided to learn more about the culture and mentality. Every week i find an amazing recipe to make on this site and I've got to say Mugicha is my absolute FAVORITE! I live in Arizona and we have an insanely dry heat ( it was in the 90's yesterday). On behalf of myself and my roommates, we all thank you for giving us a new secret weapon against the heat this summer :D. Look forward to more great recipes and good memories. Im from the Philippines and I want to try Mugicha. Where can I buy Mugicha? Is there any store here who sells Mugicha? It depends, since I live in Quezon City, there are some in Korean Stores along Don Antonio Subdivision. I always drink this since childhood, I like Barley Tea. Thanks justhungry.com! Rancid? Oh no! I have a huge bag full of mugicha tea bags - it's a few years old. I just found it where it was hiding in the back of the cupboard and was planning to make some. I was thinking teas pretty much never go bad. Is it rancid then? Now I'm afraid to open it. But there's no foil packets? Take a good long whiff of the barley - if it smells like old oil (it's very pleasant so it's hard to miss) then toss it; otherwise it's fine. Keep in mind that mugicha is not a real 'tea' as in made from tea leaves, but is just roasted barley grains, and all grains can go bad. Tea leaves don't really go 'bad' but their flavor and aroma definitely do fade if you keep them too long. I don't buy tea (or coffee, for that matter) in bulk for that reason. I drink this all year. Put a packet of the stuff (store bought and made purposely for cold water) in 2 liters of water and into the fridge it goes. So much tastier and refreshing than regular water. I actually bought some Mugicha a while ago, when the weather was still warm here in New Zealand. I come from Fukuoka-shi, (I'm half Japanese) but I moved to NZ last year, which is still strange. Most of all, the train and bus services are awful. Anyway, I remember Mugicha back home, and it's always been one of my favourite drinks, along with Calpis, Ramune and melon soda. They sold it at the local Lawson konbini, which wasn't far from my house, so my older sister and I would walk over there on summer evenings. I was shopping in town here in NZ a while back, when, in a whim, I decided to have a look in a Japanese store. They had all sorts of tea; Sencha, Genmaicha, Hojicha, you name it- but not Mugicha. But I asked, and the staff, who were very helpful, ordered it in for me. I spent the summer enjoying Mugicha with my family, and to some extent, it was like being home again! Mugicha is in our fridge all year round. We have it with every meal (for evening meals, the adults usually enjoy a glass of a fermented grape beverage before switching to mugicha) and whenever we want a cool drink. While I can't deny I enjoy the odd Coke Zero now and then, I do prefer mugicha over plain water. I have never had it sweetened; I didn't even know that it was a thing. I would ask my husband (he's Japanese), but then he would know that I'm reading blogs instead of working like I'm supposed to be doing, so I won't. We get our cold-brew mugicha sachets in big bags of 50 from our nearest Asian grocery (Hong Kong in Clayton for any Melbournites reading this) - sometimes Japanese brands, sometimes not, but there's not much difference. I love that our children, who have never lived in Japan, see it as a normal part of their lives. They even make their Japanese grandmother make it when we visit in winter. Your blog is wonderful! I fell in love with mugicha three years ago when I volunteered at the Asian Rural Institute in Tochigi. I've been brewing the bags and pouring the brew over ice, which tastes fine to me. I can't tell if they are hot or cold bags because the labels are in Japanese. I'm glad to know about storing mugicha in the freezer, though my bags are not foil covered. I'm returning to Japan this year and will stock up on more mugicha! Thank you for your interesting posts. Hi! I've heard so much good things about this tea. So on one of the trips to other town we went to Asian store to buy this tea. No one in my family likes it, unfortunately. I do, but it gives me heartburn. Such a bummer! I've been throwing in some mugicha when I make sun tea with herbs from our farm. The barely makes the iced herbal tea extra refreshing. Thanks for the storage tip. I bought a bag of bulk boricha a couple of years ago &am still using it. I'll get a fresh bag and keep it in the freezer. I love your blog!!! Very informative and inspiring. My mother always had jugs of cold tea in the fridge when we were children. But my favourite was always lemon barley squash, a cold drink that was slightly sweeter and I do love the taste of roasted barley. We also drank a coffee substitute as children; it was made from roasted barley too. My background is Swabian. Re: roasting your own barley? The verdict: Not quite the same because she couldn't get it unhulled, but delicious nonetheless. My (Japanese) mother likes to brew mugicha in the summer, but my (non-Japanese) father hasn't acquired the taste either! Just this week, I started brewing it myself, so it made me really happy to find your article in my feed. I'm sitting at my desk now with a tall glass. Barley and glutamine -- why it's refreshing? I'm MSG sensitive and heard this morning that barley and barley malt are "hidden sources of MSG." Doing some digging, I found that barley is a natural source of L-glutamic acid, while MSG is D-glutamic acid. Which reminded me that I got a big jar of glutamine when I was going through chemo to help with the mouth ulcers and terribleness... and one of the other things that glutamine is touted for is increasing hydration during and after workouts. So I have a hunch it's the glutamic acid in barley that makes it so refreshing and hydrating. Sorry to hear about the health issues you've been dealing with. Having to watch your intake of carbohydrates does sound like a bummer. I drink a lot of tea, but haven't tried Mugicha yet. In the summer, I like to make decaf green tea steeped with mint and stevia from my garden, very refreshing. Can you drink caffeinated teas, as a diabetic? Hey, I was not known about it, the barely makes the iced herbal tea extra refreshing. Thanks for the storage tip. Earlier I used to throw it away. Now after reading this I'm planning to bring a fresh bag and keep it in the freezer. Mugicha reminds me of many summer vacations to my grandparents' home in the Nagano mountains. They had several Asian pear and apple hatake (orchards) and during ocha-time in the afternoon, we would lay a bamboo mat in the middle of the trees and drink iced unsweetened mugicha and hot green tea (elders in Japan believe drinking hot tea during warm weather is good for the body since it causes you to sweat). So delicious with osenbei and the occasional ice cream cone. In the DC area, H Mart sells mugicha in cans near the frozen food section from Ito En. Thanks for sharing your memories! You know that something is really good when a non-Asian picky eater loves it for its flavor and not its provenance or history. I studied Chinese and Japanese in college and love Asian food, so I'm game for most things. My Guy, the whitest white man in N America, is not interested in the origins of anything. If it is good it is good, and if it is not he's critical. Turns out that on first introduction he LOVES mugicha - we're on our third pitcher in a week. It's a hit!! But he still doesn't like natto (which is great because I love it and that leaves more for me - had it for breakfast this morning). Ir keeps fine for a couple of days in the refrigerator. You may want to take the tea bag out if you want to prevent it from getting too dark (although it doesn't get bitter like tea-leaf tea). Any idea if boricha is at all different? or just brewed weaker? I have roasted barley of a Korean brand and it calls for 1 tbsp per liter and brews a mild, straw colored drink? I know this isn't really a Korean food blog but do you know if that's just a brewing difference? Yes I think it's just a matter of how deeply or long the barley is roasted. Boricha tends to be lighter in flavor and color (from my experience), although of course some people prefer lighter mugicha too. (if you need any help or advice on diabetic survival, let me know. I am always willing to help). Finally, thanks for the many posts about Japanese cuisine. I've just started getting into mugicha, and I have to admit that it may just be my new favorite summer drink. I was at the store the other day and picked up a bottle of Kikkoman kotteri mirin, thinking it was regular mirin. It is not. On a whim, I decided to add a little bit of this super sweet syrup to my cold mugicha, and lo and behold, it tasted awesome. Not sweet enough to mask any of the barley flavor, but just enough to take off that slightly bitter edge. Give it a try sometime! Try it with a pinch of maple syrup. Flavor of unsweetened tea constantly felt weak, but I've only ever cold-brewed. When I first tried it, I thought of maple syrup, so I finally bought a bag of the stuff and it's great! Try it! I promise you won't regret! A real pleasure in winter! A great template to cook even delicious Mugicha. I tried it and was inspired by the result :) Even in the winter, this tea is a real pleasure!